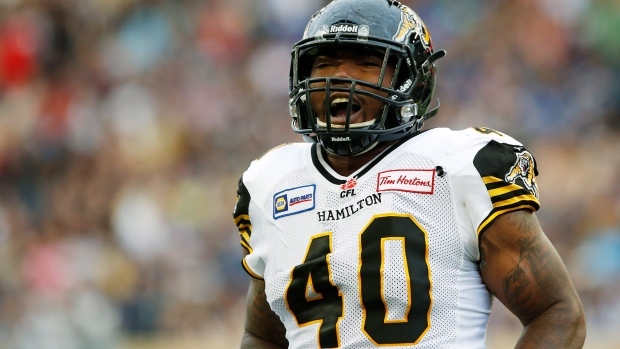 HAMILTON - Defensive end Eric Norwood was among 11 players released Tuesday by the Hamilton Tiger-Cats. Norwood, 27, had seven sacks in 2015 before suffering a season-ending knee injury. Norwood spent three seasons with the Ticats, registering 123 tackles and 24 sacks. Norwood's departure continues an off-season of change along Hamilton's defensive line as Brian Bulcke, Justin Hickman and Bryan Hall all left via free agency. But the Ticats added veteran defensive lineman John Chick as a free agent and re-signed all-star defensive tackle Ted Laurent. Also released were linebacker Latarrius Thomas, defensive backs Darnell Burks and Mike Reives, offensive linemen Cord Howard and Terrael Williams, receivers Michael Preston, Cass White and Greg Thurmond, defensive lineman Stephen Mawa and fullback Preston Huggins. Mawa and Huggins are Canadian, the others are Americans. The team also transferred DC Cliff Coleman to the retired list. The team released RB Nic Grigsby. In 2015, Grigsby played three games with Hamilton, carrying the ball 10 times for 59 yards. Jonathan Hefney signed a one-day contract with the club and retired as a Blue Bomber. He played 60 games in Winnipeg over four seasons and had 241 defensive tackles. The team also released WR Ricky Collins. The team signed DB Tommie Campbell and DB Osagie Odiase. The team signed T Sean Blomquist.